My name is Narelle and I’m an unashamed binge reader. I’ve suffered from this affliction since childhood and I make no apologies for trying to clear chunks of time in my busy schedule to binge read. I like to binge read authors by reading their books back-to-back, in the correct series order. I tend to put off reading longer books (4-5 plus hours of reading according to my Kindle app) because I prefer to read a book quickly and become absorbed in the story world. I find I lose the story momentum and forget important details when I read a book in short bursts over a longer period of time. I recently had an opportunity to catch up on reading my friend Kara Isaac’s books. What a treat it was to read her three novels in a row. I enjoy her writing style and her unique writer’s voice that shines through in her writing. Let me take you on a journey through my Kara Isaac novel binge. First stop is Close To You, Kara’s debut novel. I haven’t read Tolkien but I thoroughly enjoyed Kara’s fun contemporary romance set in New Zealand. Our heroine, Allison (Allie) Shire, is a New Zealand academic who accidentally became embroiled in a scandal due to trusting the wrong man with her heart. A Tolkien expert, Allie plays dress up as a Hobbit tour guide in picturesque New Zealand. She hides from the world in hideous costumes as she tries to unravel her messy personal life. She meets American entrepreneur Jackson Gregory on a tour and they don’t get along. At all. The sarcasm and snark flies between them and threatens to undo Jackson’s well laid plans concerning his uncle. Jackson is in over his head by pretending to be a Tolkien fan as he accompanies his uncle on the New Zealand travel tour. He needs his uncle’s assistance to finance his next business venture so he can make amends for the financial disaster caused by his ex-girlfriend destroying his business. Jackson is determined to fix his finances and safeguard his heart. He’s not looking for love and, like Allie, he has trust issues. Their romance is a rocky and humorous ride as they are forced to deal with their emotional baggage and faith issues and each other during the three week luxury tour. Allie’s mother is a large part of her problem. I finished the book hoping for a happily-ever-after for Jackson and Allie that included her mother living a million miles away from them. Here’s a snippet from Chapter Eight and a taste of Kara’s writing. Susannah is Allie’s sister who’s married to a wannabe politician. Her biggest teenage scandal had been her quitting her parents’ lifeless church, where people only went to be seen by others. From her mother’s reaction, you’d have thought Allie had started frequenting a street corner of ill repute. So of course, the one time she did the unexpected, the one occasion she threw caution to the wind and followed her heart, it turned out to be her personal equivalent of the Chernobyl disaster. Meanwhile, Susannah, who had spent her teens flitting between the wrong guys and borderline illegal activities, was now the golden girl for marrying the most boring man alive. 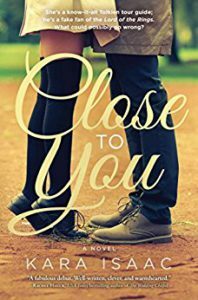 Read my complete book recommendation for Close To You here and Sally Bradley’s recommendation on Inspy Romance below. Next stop is Can’t Help Falling, Kara’s second book that’s set in Oxford, England. Peter and Emelia’s story follows on chronologically from Close To You and we meet up again with Jackson and Allie. The cameo appearance of Allie’s mother in Can’t Help Falling is priceless and a good reason for reading these books in order. Emelia Mason is hiding from her former life as a successful tabloid reporter in the USA. She moves to England and applies for a fundraising job at a charity to try and find atonement and ease the guilt from her past mistakes. Peter Carlisle, the second son of a viscount, is determined to recover from a shoulder injury and reclaim his spot on the Great Britain rowing team. He spends too much time rescuing his older, irresponsible brother from police stations. Their sibling rivalry is complex and dysfunctional. Peter first meets Allie in a wardrobe in an antique store . She’s literally in the wardrobe and dreaming of escaping to Narnia. The weird situation and strong mutual attraction throws Peter and Allie off-balance. Their unusual first meeting sets up the pattern for how their heartwarming romance will unfold. Peter and Emelia find themselves working together to raise money for his late cousin’s charity. Emelia is hiding a big secret that threatens to tear apart her budding relationship with Peter. She also doesn’t share Peter’s faith, which creates obstacles in their relationship. The faith element is realistic and plays an integral role in the story. I enjoyed Peter and Emelia’s romance in the picturesque rural English setting with an intriguing Narnia connection melded into the story. Can’t Help Falling is my favorite Kara Isaac novel. 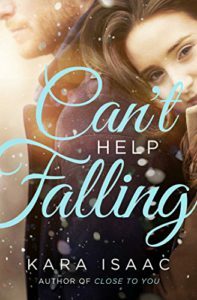 Read my complete book recommendation for Can’t Help Falling here and Janet Ferguson’s interview with Kara Isaac on Inspy Romance below. Our third and final stop is Then There Was You, Kara’s third release that’s set in my hometown of Sydney, Australia. In true binge reading style, I read most of this book on my iphone while I was in bed and too sick to do anything else. Despite the fact I had head spins if I sat up for more than two seconds and spent a large part of the wintry Saturday sleeping, I persevered because I was determined to finish the book in time to get this blog post written and scheduled. Paige McAllister makes a few impulsive decisions at her younger sister’s wedding. She ditches her long term, mostly absent and commitment phobic boyfriend, packs up her life in Chicago, and temporarily moves to Sydney where her cousin, Kat, lives. Paige carries a truckload of emotional baggage with her, including a fear of flying and a massive distrust of megachurches. Josh Tyler was born into Sydney megachurch royalty. His parents founded the Aussie megachurch where he’s the lead guitarist and singer for their internationally successful worship band. His past relationship mistakes and the media’s obsession with his family have led him to retreat into his megachurch bubble where his life revolves around his close knit family and worship band responsibilities. Josh’s first impressions of Paige from their accidental meeting on a flight to Australia stay with him, and he questions his mother’s wisdom in employing Paige as a logistics manager for their upcoming women’s conference. Josh and Paige are forced to work together, and Josh makes some big assumptions about Paige without checking his facts. Paige is seemingly on a mission to make decisions that will make her life more difficult. A few Google searches could also have made Paige’s life in Australia easier. They develop a sort-of-friends romance where their emotional barriers remain in place for most of the story. Once I got to know Josh and Paige, I wanted to see them take risks and overcome all the obstacles in both their romance and faith journey to achieve their happily-ever-after. I shed a few tears toward the end and finished the book with a smile on my face. The story is also connected to Kara’s earlier releases. Paige’s cousin, Kat, is Allie’s best friend in Close To You. 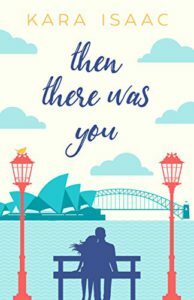 Read my complete book recommendation for Then There Was You here and Kara’s recent guest post with Janet on Inspy Romance below. Do you binge read? Have you stockpiled books by favorite authors to read in a row? Have you read Kara’s books? Kara will be at the Romance Writers of America conference this week and Close To You is a double RITA finalist. I’m cheering for Kara from Australia! Hi Narelle. I also am a binge reader, which started as a young girl reading the Boxcar Children. In my thirties, when life was hectic raising children, teaching school, and being a pastor’s wife; during summer break I had “Reading Day,” so I could read at least one book from cover to cover with few interruptions. My sons knew not to disturb mom unless they were bleeding or dying. They still tease me today and for birthdays and Christmas buy me Amazon gift cards. With my reading obsession, it is no wonder I was a high school English teacher. Now in retirement and with a Kindle app, I can read all the time. I am not one to save sets from one author to read from start to finish, only a book. I also prefer shorter books – in my old age I have a shorter attention span. LOL – Main reason that I want to read to many books by too many authors. Thanks for introducing us to Kara Isaac. Interesting author with interesting stories. I especially like that each story has a different setting. Always enjoy reading books with international setting, because I am an arm chair traveler. Not sure I can add a new author this summer, but adding her to my log and wish list. Best wishes. I’m a binge reader too! Kara Isaac’s books have been on my radar for a LONG time…. I read a lot. I love to read a series all at once but it’s not always possible since a lot of the books I read are borrowed from Libraries Unbound and I can’t always get them one right after the other. And I always have to have a book in progress. I haven’t read any of Kara’s books but they sound delightful. I must admit I’m a binge reader too. With the Lord’s help, I try to keep it under control when I have other responsibilities :-) The thing is that my husband goes to bed early, and I really wake up about the time he goes to bed, so the house is quiet and it’s so easy to just keep reading! I’ve entered several giveaways of Kara’s books, but haven’t won any yet, and am trying to limit how many books I buy until I read the ones I already have! I enjoyed Close to You, though I wasn’t sure I would because I’m not a Tolkien reader. I haven’t read Can’t Help Falling, but Then There Was You is on my Kindle, waiting for me to get to it. I do enjoy Kara’s voice! I don’t call myself a binge reader but I do like to read all of a series in one stretch. I have one of Kara’s on my shelf but I guess I need to get the first two first! I call myself an avid reader! I do enjoy reading books of a series..in order. I have read and enjoyed 2 of Kara’s books! Oh and no I have not read anything by Kara Isaac yet. Hi Narelle! My name is Priscila and I’m a binge reader. However, I haven’t binge read in the past 6 months (since my baby boy was born). I’ve missed reading, but not as much as I’d thought I might. Because having a baby makes anything else looks pale in comparison. I still read, but I’ve downgraded to short stories and novellas, or just re-read books I enjoy. First I thought it was because I’d never see the end of a novel in the speed I was reading, but then I realized it’s because they’d take less emotional investment and not make me want to binge read when I should be spending time with my son. I’ve suffered from binge reading since I was a kid and had to spend close to a month in the hospital… with only one thing left to do: read. When a new book of my favorite series would come out, I’d clear out time in my schedule (do homework super quickly, get chores done in a hurry, …) then I’d skip family time and tv time and just get to a quiet place and read. Sometimes I’d take my books to school, but I’ve valued them too much to get them lost or scratched, then just hurried back home to read some more. Sometimes mom had to remind me to stop to eat. There was this one series I’d go to the bookstore every now and then to look for a new book and every time one came out, I’d devour it within the day, then re-read all the previous ones and again the one I just bought. Recently the author decided to published a “married years” and “baby years” continued series to that, which has got me hooked up again (seems like my favorite characters and I still share the same life pace). Also, thanks for sharing about Kara’s books. I’ve read the previous posts and put those books in my TBR list.. but reading about them motivated me again. I used to be a binge reader before I started writing. Now I’m just happy to squeeze some reading in whenever I can. Hi my name is Trixi and I am a binge reader! LOLOLOLOL!! I stockpile series books and don’t read them until I have every book, because who wants to wait MONTHS on end for the next one to come out? I have too many books I want to read, I ain’t got time for that, lol! I’ve only read “Can’t Help Falling” by Kara and really want to read “Then There Was You”.